Great creations begin with a flash of inspiration and an idea. Brandyn Armstrong has been putting his creative sparks to good use for over a decade in his own neighborhood nurturing the grass roots music scene. Now he is branching out with a product that is poised to benefit creativity wherever it may strike. Armstrong writes his invention ideas in a small notebook as soon as he thinks of them, and his latest brainchild is designed with that same on-the-go inspiration in mind. After spending his formative years entertaining his community, the now 23-year-old has channeled that love of music, drive and ingenuity into a product that anyone can use to create their own recordings. Armstrong's creation transforms smart phones into portable recording studios, allowing artists to record vocals wherever they may be. Weighing 10 pounds, Studio Stick is 20-inch tube that expands up to six feet. It includes a reflective filter to prevent sound from bouncing around, a microphone that enhances recording quality, a filter that prevents popping noises in the recording, and a phone/tablet holder. Per Armstrong, Studio Stick produces studio-quality sound unlike other apps that only use the phone’s microphone and produce inferior recordings. “It’s the first product that allows you to record industry-ready songs while on the go,” he adds. Targeting independent recording artists, the product eliminates the costs associated with studio rental and production. The included Studio Stick app, which Armstrong keeps updated, allows users to change frequency, add effects, multi-track, copy, paste, mix, master, and perform any of the functions of finishing a track in a professional studio. It works with Samsung and iOS operating systems on cell phones or tablets and comes with tutorial videos. Armstrong has received an overwhelmingly positive response from prospective users. His team is currently preparing to launch Studio Stick online, in music stores, and in retail stores. He is also negotiating for possible future collaborations with other major applications. The rosy future of Armstrong's Studio Stick venture is a departure from difficult episodes in his past. Armstrong’s father was killed when he was four years old, after which his grandmother took him into her East Cleveland home. He bounced from house to house after she went blind when he was 10. A musician since the age of five, Armstrong began recording music at age 13 with a group of friends who called themselves T.Y.S. A couple years later, he began a record label called 9 Front Entertainment. However, the death of one of the T.Y.S members sent those ventures into a tailspin. Armstrong began to get in trouble in high school. His grades began to fall, and eventually he was kicked out. However, he credits those tough experiences with making him the businessman he is today. “I knew that if I didn't get my head back on the right track, I would end up either dead or in jail,” says Armstrong. “And I wanted neither of those. I knew something had to change so that's when I decided to check out Tri-C,” which is where he earned his G.E.D. Now with associate degrees in both business administration and arts, Armstrong is currently pursuing a bachelor’s degree in business administration from Cleveland State University (CSU). 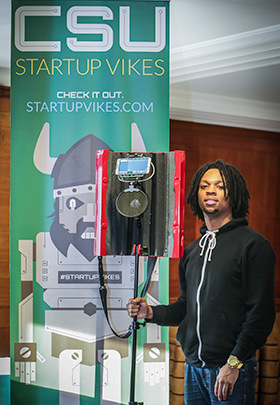 Although he initially had no idea how to bring his Studio Stick idea to fruition, as luck would have it, he learned of CSU’s annual business competition StartUp Vikes. Not only did he win $1,500 at the April 2015 event, but he also met his future director of business development, Aaron Pike, and two engineers who would come to join his team, Ron Brengartner and Thomas Hayes. After exhaustive research, he wrote his own patent for the product (to save money) and used his prize money to obtain the patent, trademark, and other business essentials. “It is truly a unique invention that came from a real need,” notes president of American Rail Corporation and 2015 StartUp Vikes judge Ameer Alghusain. He adds that Armstrong’s business does not require a significant amount of start-up funding and that the young inventor created an exciting product on a tight budget using affordable equipment. It will also have a positive social impact, especially on young artists and performers. Armstrong is confident that it will, but he does not plan to stop there.